Since March when the Ebola outbreak was reported in Guinea, the disease has killed over 1,100 people in West Africa throughout Mano River Union countries like Liberia and Sierra Leone. 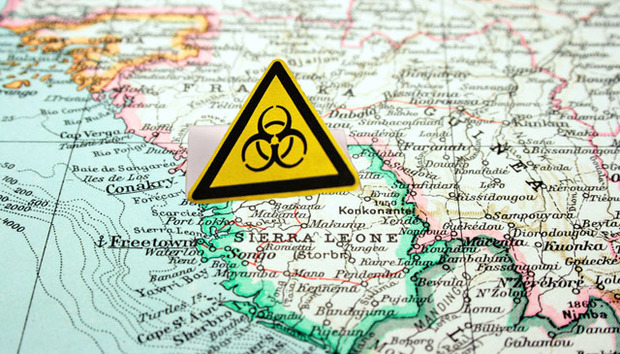 In fact, about 300 of the deaths are from Sierra Leone alone, and this is the worst outbreak in history according to the World Health Organization (WHO). WHO later declared the outbreak an International health Emergency, raising an alarm the world over. As a result major international airlines, including British Airways, Arick Airlines, and Gambia Bird, stopped their flights to Freetown and most embassies ordered their nationals to leave the region. The virus has no cure at present even though some new drugs have been identified and are being put to the test. Yet in a society where the people and even the medical staff have limited, or no knowledge, of the disease because this is the first time it has hit the region, community denial has made the situation worse. In fact many people have become frustrated and drawn some conspiracy theories that make them doubt the efforts of health workers to stop the epidemic. This makes the intervention of community radio stations and telecommunication companies invaluable in fighting this killer enemy. Information, they say, is power. But in times of crisis we need information more than ever because it is as crucial as food, water and medicine. The answers to simple questions like, where can we go for help? What danger should we be aware of? Who will give us the advice we need? can spell the difference between life and death. And if communities don’t know and trust sources, even the most vital information will miss the mark. Lives can be saved with timely, sufficient and well-targeted information, says one community radio journalist. This makes the importance of community radio stations invaluable during this period of the Ebola outbreak in Sierra Leone, especially when the disease was first associated with witchcraft when it was reported in Kailahun in the East of Sierra Leone in May. Denial from local communities was very high. And to make matters worse, handshakes, greeting the sick, burying the dead, eating of bush meat were some of the main methods of transmission identified. Yet all these are common traditional practices of local communities. As the mortality rate keeps increasing, including the shocking death of Dr. Shiek Umar Khan, the leading doctor in the fight against Ebola in the country, the government of Sierra Leone declared a state of emergency and the community radio stations and telecommunication companies have joined the fight. Fortunately for Sierra Leone, the concept of community radio stations was introduced after the war as development partners facilitated and established community radio stations in every district of Sierra Leone broadcasting messages in languages the locals can understand. So the Ministry of Health and Sanitation [Facebook page] now produce simple and clear messages in local languages on modes of Ebola infection, hand washing, along with clear instructions on what to do if you suspect signs and symptoms. The right messenger to use is the community radio stations. The Sierra Leone Association of Journalists (SLAJ), the umbrella journalists' organization, instituted a national radio programme called ‘Dreb Ebola Hour ‘ (drive Ebola hour), which links all major community radio stations in the country, to reach listeners across the country with updates on the Ebola situation. It also partners with Ministry of Health officials to use the medium to connect the populace with the right information at the right time. The BBC Media Action has also instituted local radio programs and worked with selected local radio partners to produce Ebola related programs and news updates regularly to inform the populace on what to do and how to prevent themselves from the Ebola virus. It also promotes the key messages of hand washing and how to prevent Ebola from spreading. This has helped greatly as people now call radio stations on a daily basis to report suspected Ebola cases in their communities or report people who try to hide suspected Ebola patients. This has reduced the rate of denials. This is important as the Health Minister, Miatta Kargbo, has accepted that denial of the existence of the disease by community people at first was a big challenge that even put her health workers lives at risk. Now Ebola patients can be traced quickly to stop the spread and if it continues this way, Kargbo states, the issue of Ebola will soon be put to rest. The Ministry of Health has also partnered with all mobile telecommunications companies, who now send SMS messages on a daily basis on methods of transmission and symptoms of the disease. A free toll line of 117 has also been created by all mobile companies to call and report any suspected symptoms of Ebola in any community. So all mobile users can now call to report cases of Ebola in their communities. This is being popularized by the various community radio stations. People’s comments are noted and rapid responses are sent to intervene almost immediately. The lesson this is teaching us is that no matter how powerful the international media might be, it is not capable of playing the role of community radio stations in Africa because of language barrier, proximity, and trust. Even though these community radio stations are struggling to survive due to inadequate funds, resources and training, they are still capable of playing their traditional role of informing their communities in their own language. This crisis has proven the messenger is as important as the message itself. So as we still continue to battle the Ebola crisis, I say well done community radio stations, this is your own contribution in this fight. You sometimes put the lives of your staff at risk to go to the worst hit areas where foreign journalists are afraid to go and interview victims and health workers. And your contribution will not go unnoticed. In the end, when history will be written, your efforts will be remembered for the right reasons. When the international media is busy telling the story in its own way, you are busy reaching the people with messages of home.